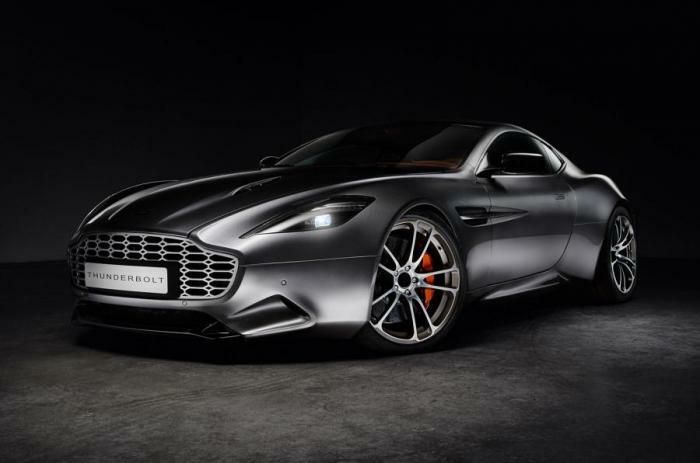 Henrik Fisker reveals Aston Martin Vanquish-based Thunderbolt concept! Former Aston Martin designer and Fisker Automotive founder Henrik Fisker has unveiled a new concept called Thunderbolt. It's based on the Aston Martin Vanquish but has been lowered by 15 mm and sits on 21-inch alloy wheels wrapped around in performance tires. The most obvious change is represented by a reworked carbon fiber body combined with an enlarged grille and a far more sloped roofline ending with a raked rear windscreen. Other noticeable changes include redesigned LED taillights, large power dome, triangular air intakes and a trunk-mounted spoiler. Stepping inside the cabin, the most important feature is a high-resolution 11.6-inch Panasonic Curved Control Screen developed to reduce glare and reflections. There's also a Skeleteon chronograph built into the dashboard while Italian furniture manufacturer Natuzzi provided some of the specially trimmed leather surfaces. On top of that, Henrik Fisker's Thunderbolt concept also boasts a champagne/wine bottle holder. Although it's being described as "purely" a design study, an "extremely limited number of additional cars" will be built on special order by Galpin Aston Martin.